Are you feeling like you’ve outgrown your current home? Has your life changed over the years? This could be a sign that you’re ready to move out of that starter home and into something that more closely aligns with your lifestyle. Keep reading to learn the signs that you’re ready to move up! It may be a good financial decision for you to move into a nicer home if your current home has significantly increased in value. Check with your Realtor about the current value of your home. If it’s worth much more than you bought it for, now might be a good time to sell and put the money from the sale toward buying a bigger place. Have you or your partner experienced an increase in your yearly earnings? If so, you may want to crunch the numbers and see how much more house you can afford. If your earnings have remained stagnant, then buying a more expensive home is probably not a good financial move. However, your life may have changed since you bought your first home, and perhaps you can afford a house that delivers a little more luxury or one that’s located in a better area. Maybe you loved the neighborhood you live in when you first moved there, but if you’ve owned your house for a while, chances are the neighborhood has gone through some changes. Maybe it gained in popularity and younger people have moved into the area, making the streets busier and louder on the weekends. Since smaller cities and suburbs are seeing an uptick in new residents, your area, like many others, could be becoming more transient and less community-oriented. Has your lifestyle changed because you started a family or got a demanding job? You may have outgrown your starter home with the addition of new family members. Or, perhaps you need to live in a house that is closer to the office. 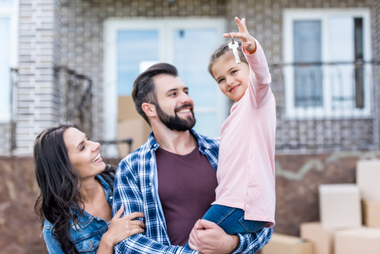 Many people become move-up buyers because their lifestyle has significantly changed since they bought their first home. Other things to consider: Before making your final decision, ask yourself these two questions to make sure you’re ready to move up. Can I afford two mortgages? Depending on the order of events, there is a chance that you could end up buying your new home before selling your old home. In this case, can you afford two mortgages? Or have you researched financing options, such as bridge loans and home equity loans? Can I afford moving costs? When figuring out your budget, factor in moving costs, such as closing fees, Realtor commission and hiring movers. Think you’re ready to take the plunge and move up? Contact us today to start the process!